GMHBA Stadium is another popular sports venue south-west of Melbourne in the city of Geelong (previously known as Simonds Stadium). This popular ground is known for hosting a number of major sporting events; predominantly AFL matches of the Geelong Cats. Visitors interested in watching an event here should consider purchasing tickets way in advance, as most match day tickets are often sold out. GMHBA Stadium is easily accessible by car or train. To catch a train, take the direct train from Southern Cross Station towards Geelong. Hop off at South Geelong Station that is only a short 5 minute walk to the stadium. If you would like to check out Geelong before the game, get off at Geelong Station. You can still walk to the stadium from Geelong, but it’s slightly further – a quick 10-15 minute walk. Alternatively, you can always drive. The stadium also offers ample parking spaces for all spectators. From the CBD, the drive takes around 60 minutes, but if you’re heading to one of the big blockbuster matches, make sure you leave a little extra time. In addition to the AFL, numerous conferences and private events are also held here. Near GMHBA Stadium, you will come across many pubs and restaurants. Sit back and enjoy a great meal after witnessing a great sports match with your friends and family. Some of the most popular pubs near the venue are Club Cats, Geelong Supporters and the Clarendon. In addition to these pubs, you’ll also find an array of restaurants and hotels on the Geelong waterfront. 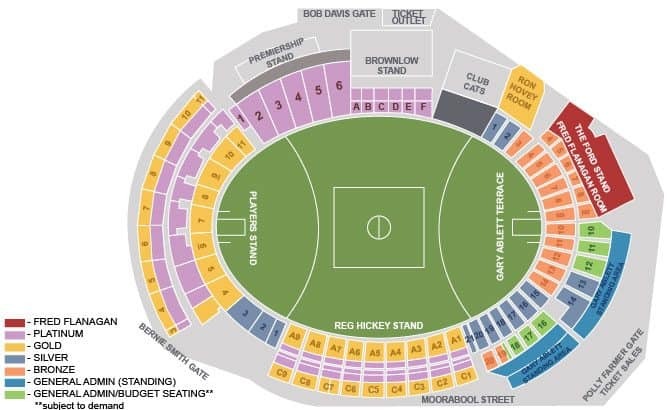 Seating plans will vary based on the type and size of each event, but here is an example of a past event held at the GMHBA Stadium in Melbourne.